Indian roads are flooded with cars.Parking & traffic will be an issue in the cities.Also the presence of a strong middle class consumers upgrading from their two wheelers to a small hatchback car is forcing companies to hover around at the entry level segment. Tata Nano was the game changer after years of Maruti 800 dominence. Now Hyundai is coming with their own 800 cc version.However as expected hyundai will be bringing an overpriced car. 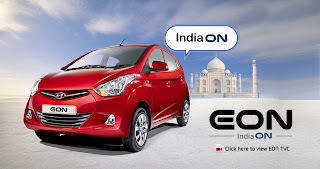 They are calling designs of hyundai fluidic.Now they are telling us that Eon is also fluidic.I am still trying to find what this thing is. Anyway Eon is showing resemblance to i10,120 and verna.Just like the way nano resembles old indica.Good fit and finish, comfortable to get in and go out due to tall boy design.Some people do not like the rear view of Eon. Contemperory designed interiors that put all small cars to shame.Tiltup steering is useful.Main features are two tone colors, better plastic quality, ample interior space.Seats are of average quality and legroom is insufficient. It feels just like driving a more powerful medium size car. The steering wheel and gear knob is showing some vibrations which means it will be tiresome in bumper to bumper city traffic.The best way to get great mileage is to follow the gear shift indicator.Car manufacturers say suspension is made for indian roads.Eon will make travel of a small family happier.Powerful ac, super mileage,driver airbag in topend varient and stereo is another attraction. Price of Eon is a dampener. 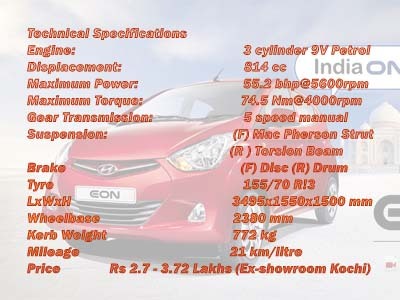 3.12 lakhs ex-showroom price is just too much for the facilities it have but this car will be a hit as many people will find it attractive. ARAI Mileage is 21.1 kmpl.